Alva L. Eakin : The Passing of Old Hawaii, 1911. Eakin, Alva L.: The Passing of Old Hawaii. Volume 1, Number 4, April,1911, pages 475 to 484. Alva L. Eakin writes of the changes in Hawaiian society in the ten years between visits, circa 1900 and 1910. 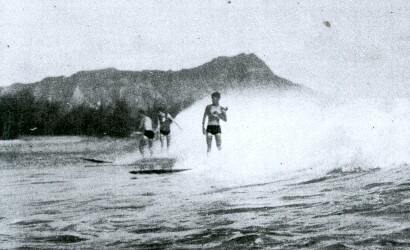 The reduction in number of native surf board riders and their restricted access to the beach at Waikiki with the development of seafront hotels is noted on page 477, while the increasing popularity of the sport with the immigrant population is reported on page 480. A large proportion of the article, illustrating racial attitudes of the period, focuses on the demise of native Hawaiian population and the complex mixture of Asian, European and white and/or "American" races. White men born in Hawaii have seen the native population drop in their lifetime from nearly a quarter of a million to less than thirty thousand souls. Young men now at Oahu College may live to attend the funeral of the last of the Hawaiians, if the present decrease continues for another quarter of a century. I have visited the islands twice, a decade intervening between my visits, yet I was apalled by the wonderous change that had taken place even in that short period of time. Mark Twain knew Hawaii when there were 100,000 Hawaiians; I came but a few years later and there were scarce half as many; today they are but a passing people with their days and years numbered - and the number of these years is in two figures. The Old Waikiki Horse Car. "No alien land in all the world has any deep, strong charm for me but that one; no other land could so longingly and beseechingly haunt me, sleeping and waking, through more than half a lifetime, as that one has done. Other things leave me, but it abides; other things change, but it remains the same. For me its balmy airs are always blowing, its summer seas flashing in the sun; the pulsing of its surf beat is in my ear; I can see its garlanded craigs, its leaping cascades, its plumy palms drowsing by the shore; its remote summits floating like islands above the cloud-rack; I can feel the spirit of its woodland solitude; I can hear the splash of its brooks; in my nostrils still lives the breath of flowers that perished twenty years ago." Mark Twain penned these lines while quarantined off Honolulu harbor. It was a bitter disappointment to the great writer that he could not land. How fortunate that this man who has made the whole world laugh, had still in his old age one illusion to cherish - one ideal that never tarnished - one charm that was as true to the last as when in the dreaming many years ago. Fortunate man to see the Promised Land from afar, and sail away with his long-cherished illusions still intact - his most treasured dream still true. I landed - a decade had worked miracles - the kingdom of savage King Kalakaua had become part of a civilized Republic. Where I had once been welcomed by happy, smiling maids; wreathed in smiles and gayest flowers, scowling longshoremen now cried not "Aloha," but "Move on, please". Where the sleepy little mule car wended its lazy way through picturesque gardens, the swift-going electric motor car now bore me onward between rows of local skyscrapers - the native market and its strange, picturesque groupings had disappeared to make room for unsightly modern brick office buildings - native women no longer cried their simpIe wares or threw long chains of red and yellow flowers about the neck of the wanderer - through the streets the Kanaka maids no longer roamed on horseback, their long, divided skirts of gorgeous hue trailing to the ground - and, saddest of all, one whole sectIon of beautiful gardens in the center of the little settlement was obliterated forever, its site buried beneath a vast modern hotel of the inverted dry goods box pattern, so typical of Chicago, New York, London, or Bombay. And Mark Twain sailed away from all this; how his soul would have rebelled at such desecration of his paradise; the fair, green garden of his glorious youth turned into the backyard of a city lot! The Electric Road to Waikiki. "They have Americanized the place - there is nothing to paint but straight lines and square dry goods boxes - look!" We stood on the site of what had once been the beach at Waikiki. The Yankee dry goods boxes had been pushed down to the water's edge - miles of them - the graceful curves of the beach broken by stone walls and heavy breakwaters abutting into the sea - miles of once glorious beach fenced in from the native who was once wont to ride in majesty upon the mighty waves that rolled in from the sea in mile-long breakers. In days of oId he stood like a king upon their crest and sped from the sea to the shore. Sometimes hundreds of brown-skinned natives enjoyed the sport - today, two young natives were practising the ancient native pastime at which they were no longer expert; a long, jutting wharf formed the background for this picture that had once had naught but Diamond Head and the cloudless blue beyond to set it off. It is not so long ago that with wonderful skill the brown men and even women would place their boards before an incoming billow far out at sea, keeping just in advance as it rolled onward - then, as the billow formed, with a mighty shout a row of dusky, crouching figures would leap upright on their a boards, stand erect, and with waving arms urge their steeds onward in a mad race with the giant billow; for a quarter of a mile the short six feet of thin plank would keep its nose abreast of the foaming billow and then shoot ahead at a motion of its master's feet, spring onward, mount the shelving beach, and leave the angry wave to tumble after with a sullen roar of disappointment. Today in one of the surfers the skill was there - but it was not the same- no nodding palms beckoned the surfer on; square white buildings stood out in bold relief as if to forbid his approach, and where he landed there was a walk of perhaps a mile before he could find some little alley that would permit him to slink away with his surf-board, to the main road - this native son of Hawaii seemed a stranger in a land where every other people of the Pacific make themselves at home. Local patriotism in the days of the Monarchy, and a wise desire not to deprive the natives of their one great playground, caused the white settlers to leave a road way along the beach open to the public. Great wealth has come to many since those happy, careless days, and with it the usual disregard of the natural rights of others. The Old Native and His Surfboard. ... electric cars now whirled by through miles of Chinese farms and plantain plots. It was not until the old Royal Hawaiian Hotel was approached that a bit of the real Hawaii of twenty years ago - the fragrance of which lingered so long in the nostrils of the happy humorist - burst upon me with the allurment of those bygone days when indolence reigned supreme in a land where none need work. This old pile, erected by the most immoral of all the kings of the islands, is still the beauty spot - the little park - the remnant of bygone days of old Hawaii. At night the native singers still wail their plaintive notes, and the Kanaka musicians still bring stirring appeals to the soul from instruments of string and wood. For a quarter of a century there has been an "Alameda" night. At the Hawaiian Hotel, upon every arrival of the old trusty San Francisco boat, a ball is given in honor of the event. Native singers and musicians chant during the dinner hour, and later, during the ball, every dance is sung in HawaIIan, the language seeming to lend itself to such a use. I had never before danced to vocal music, I never wish to dance again to any other - I have never heard any other so suitable to the dance; the rich voices of the natives urge on feet that possessors long believed had lost their nimbleness. 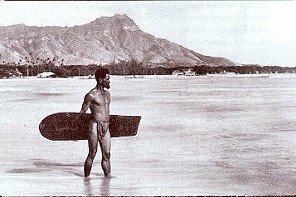 After dancing to Hawaiian songs I felt no misgiving but that I could learn to manage the delusive surf- board, and ride nimbly upon the crest of the island breakers as do the lithesome natives. It is old Hawaii that inspires one, after all. I went to bed once more enchanted with the Paradise of the Pacific, intending the next day to resume the old life where I had left off. Years ago I had wandered up a littIe valley that hides itself behInd Punchbowl Hill. ... delectable spot in the whole world, and, save for a few vistas in Japan, Italy and Madeira, perhaps it is. I had wandered then with all the delusions and anticipations of youth; a new world was being opened to me - everywhere native Hawaiians received me in their humble homes with gladsome "Alohas" and with leis of flowers. It was like a tour in a dusky paradise. As I climbed higher and higher, more wild grew the scenery, and more delectable - tawny children, boys and girls, flitted about, gathering wild guava, or disporting themselves in the silver streams. Taro patches everywhere beautified the landscape - indifferently cultivated it is true, by the lazy, happy, brown people - I longed to see this bit of real Hawaii once again. I plunged into it - and it was not there. In huts and cabins where the gladsome "Aloha" once welcomed me, the stolid Chinaman now held sway; intensive cultivation had replaced the carelessly set out taro patches. No one made poi, no one made me welcome. At the brooksides Chinese girls in strange, long trousers, stooped to dip up water in great tin buckets which they carried suspended from long poles resting upon their shoulders; it was a bit of China, not Hawaii, I had stumbled upon - picturesque - but out of place. If the picture varied, it was to introduce me to a bit of new Japan. In one valley today the practical Chinaman grows fruit and vegetables for the Honolulu market, and far up on the heights I found three Japanese girls and their mother cultivating a field of violets - but nowhere could I find the merry, happy-go-lucky Hawaiians of but a decade gone by. They and their alohas were silent - in that valley, forever. ... its beauty wiII be a thing of the past - only a remembrance to those who knew it in its delectable days. Down at Waikiki the small white boys reign supreme on the native surf- board and in the Hawiian outrigger canoe - they have captured the ocean. The natives have been all but driven from the beach - native men and women no longer sport upon the crests of the waves as in days of yore, and the native girls have been taught that it is beneath their dignity to come sailing in from the sea with the speed of the wind - although many little white girls indulge in this greatest of all aquatic sports without mortally injuring their infantile dignity. So much as to my first impressions of Hawaii revisited - but after a three- months stay! The charm of the tropics was still upon me - it has returned with fourfold force. The old Hawaii had passed away, but the new was equally entrancing. In places where the ancient hawaiian grass houses had stood I found the white man's house modified to the condiions of climate. Here, as nowhere else in the world, has been solved the problem of building a perfect tropical home - one or two stories at most, and a great broad, rambling piazza with no other roof than the spreading hau tree, and beneath the trellis work supporting these evergreen boughs that spread for acres, if so trained, banquets are served and balls are given. The flooring, through which in places palms and banana trees are permitted to grow, is made of polished native mahogany. Nearby, if the natural house is upon the beach, is an open sandy spot beneath the friendly hau, where rests the koa canoe, polished by its native builders till it shines like ebony. On an afternoon, in December or May, for it is all one in Hawaii, canoeing parties are given, the outrigger is launched, and everyone in his bathing suit prepares for a rlding before the waves and a probable ducking in the warm waters of the ocean. Life in Hawaii is still idealistic, but it is no longer Hawaii for the Hawaiians; he is less in numbers than any other race upon the islands that were once his to command. I had left Hawaii when the native outnumbered the Oriental; I returned to find four Orientals in Hawaii to one Hawaiian - and all within ten years; the Oriental population had increased one hundred per cent; the natives had decreased half as much. In another ten years, perhaps, Hawaii will be Japanese, to all intents and purposes at least; even today the Japanese population in our island territory probably outnumbers all other races there, including his numerous cousins, the Chinese. One might say Hawaii is passing to Japan. I recall the days, and nights, made glorious by the native fishing feasts, oh, so short a time ago - the beating of the water, the spearing of fish by day, with torch by night, by brown-skinned divers who wotlld, spear in hand, spring into the water, disappear for minutes, it seemed - then bob up again - heralded perhaps by a struggling fish upon the end of a spear that rose like Neptune's trident from the sea. Natives there were who delighted in fighting the largest sharks in their own element, armed only with a glittering blade of steel - nowadays white men tow out a dead horse and wait by the carcass to harpoon, from a launch, any hungry, venturesome shark that may approach, while all the deep-sea fishing is done by the Japs from their gasolene-propelled sampans. ... near Honolulu, and in the market the Hawaiian has disappeared entirely before the Oriental. The Hawaiian army has dwindled away; in place of showy dress parades, a solitary Hawaiian policeman is now and then to be met with. A dethroned queen has retired to private life, few so poor now as to do her homage. Yet but a few short years ago white men of high standing thought it not amiss to marry dusky queens and princesses of Hawaii, Royal princes are now out of place in society that once more than tolerated them. Princesses of the blood did make themselves beloved by all for their good deeds, but they have all passed a\vay and every year the color line is being drawn more and more closely. Elderly white men still marry beautiful and refined hapa-haole girls (half-whites). and their offspring, scarcely discernable from the pure whites, are received everywhere, but many white women of the present generation in Hawaii decline to send their sons to dancing school for fear that once they learn to dance it will be the fascinating hapa-haole girl who will make them perfect in the art, for the hapa-haole loves, above all things, to sing and dance and make those about her merry and happy. The dusky faces are gro\ving fewer every year in social circles in Hawaii, and soon these gentle, loving people will have passed away from the very functions at which once they ruled, and the white man was the invited guest. In Americanized Hawaii even royal blood is no passport to the social functions of the elect. The Hawaiian still rules Hawaii, although in the minority, and the white element merely sits back awaiting the complete passing of the brown man - which both know to be inevitable within another generation, at most. Every Hawaiian became upon annexation an American citizen; more than thirty thousand strong then; less now. Every Portuguese, German, and British subject did not become Americanized, so it is that the vote of the brown man in Hawaii still makes the laws for five times the number of whites, Orientals and half-breeds. The children of Chinamen and Japanese, born in Hawaii are coming of age; they are Americans; will add every year increasing hundreds of these oriental citizens to the voting lists, until the brown man is forced to yield to the yellow. The wealthy sugar planters have seen that unless they bestir themselves the complete Orientalization of Hawaii is inevitable. They are now spending millions annually introducing Spanish and Portuguese immigrants, and would gladly spend more to get real American citizens to move over from the mainland. After the islands have passed from the political control of the brown man to the yellow, it will be in all likleyhood be placed in the keeping of the children of thepresent Spanish and Portuguese population - and in Hawaii the Portuguese speaks of himself as a thing upart from the white man. Americans will be the last of all to come into the complete heritage of the Paradise of the Pacific, yet not the Oriental nor any other race can make of these islands other than what they are - a Paradise. So complete is the passing of the native Hawaiian, that at one public school in Honolulu in a photograph I took of twenty of the pupils, each of the score was of a different nationality; of the six hulldred scholars enrolled, scarcely five per cent were full-blooded Hawiians, although there were present mixtures of Hawiians with almost every one of the twenty nationalities represented in the photograph I had taken. It is the mixture of Chinese and Hawiian blood that produces the best result, the children being superior in every way to both parents, inheriting the good qualities of both to a marked degree. The hawiian, even after this race is extinct, will live for generations, never quite lost, in the blood he has given to enrich with his own. ... nothing for a young person to declare that he must die, and promptly lie down and yield up his spirit. This depressing custom is horribly prevalent among the young. Although the native Hawaiian is passionately fond of children, he seems to have lost the art of weaning them. He can never understand the rules of hygiene connected with civilized clothing. Baby is wrapped up, his clothes may be dampened by a shower, and damp they remain. The old grass houses were self-ventilating - the modern wooded structure with its tightly closed doors and windows, to say nothing of the life-eating oil lamp that is left burning all night, is not conducive to rearing healthful babes; in fact, the infant mortality among the Hawaiians is larger than among any other people in the world, and accounts for the fact that the race is disappearing at the rate of a thousand deaths over births every year. Old Hawaii is merging into the new. Here and there have sprung up quaint little Japanese vilIages that promise in time to be as picturesque and charming as any in the Flowery Kingdom. In years to come we may have a fairy-like bit of Japan at our very doors. The Portuguese are building their villas beneath the shade of the grape vine, and about Honolulu already we have a bit of old Madeira. The Chinese have created a new Canton in their business district, and splendid temples compel by their very gorgeouness the attention of the tourist. Hawaii has become the gateway, the preparatory school, as it were, to the Orient. On the Island of Hawaii itself, in far-off, out-of-the-way districts, may stilo be found the Hawaii that Mark Twain knew so well: native vilIages of grass houses, and simple brown peole who plant their taro, and that duty once performed, treat life as a frolic - one long picnic of delight. ... there are industrial schools for native boys and girls. Few there are who remember the art of beating tapa (native cloth) from the bark of the mulberry; fewer still who recall the motions and poses of the ancient hula-hula as it was before the white man came and insisted upon its vulgarization. Still in forgotten valleys one may find an old man at work thatching his hut, or an octogenarian who can still play the nose flute for the young women who would dance by its weird music. Hawaii is still Hawaii for the student, and for the lover of the beautiful its marvelous mountains and volcanoes will always make its scenery the most distinctive of any island province in the whole world. The Hawaiian has bequeathed many of his sports and pastimes to the white usurper, and even the stranger quickly part of the recognized language spoken falls into the habit of using certain Hawaiian words that have become a in our new Territory. Pilikia is so convenient a word to describe any sort of trouble - from a mosquito bite to a cataclysm; wiki-wiki is always used in place of "hurry," and pupule, which means foolish, can be used on all occasions without serious offence. Kapu, which means forbidden, has given a word known the civilized world over, and the native luau, or feast, is, in Hawaii, at least, the recognized method of extending hospitality to strangers and friends alike. Often still, one may partake of the luau in its pristine splendor, seated on the long, soft grass before a table of banana leaves, before him gourds of poi, boiled lobsters, all kinds of fish, baked or boiled in ti leaves (from which you unwrap them) and, most glorious of all, steaming roast pig from the oven of nearby. Even at the white man's luau, where hundreds sit beneath in modern chairs at improvised tables, the pig is left to the native in his improvised underground oven, and is brought to the festive board whole, upon a great wooden platter constructed for this special service. So long as the luau is remembered in the Paradise of the Pacific, old Hawaii will not be forgotten in the hearts of the people. remain for long you will never wish to leave behind the new Hawaii that is taking its place. There is a charm about this Paradise of the Pacific possessed by no other land in all the world. The Hawaiians may - and probably will - pass away, but the Paradise of the Pacific remains the choicest heritage of the American people. Here there is rest for the weary, and the troubled quickly cease from worrying; it is the little oasis in all America that never disappoints; he whono has not seen Hawaii cannot say, "I have know perfect rest - I have seen the most beautiful thing in the whole world. Geoff Cater (2011) : Alva L. Eakin : The Passing of Old Hawaii, 1911.